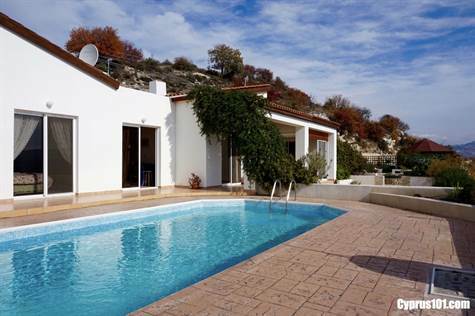 Agios Demetrianos, Paphos District – This custom built 3 bedroom detached bungalow for sale in Agios Demetrianos is situated in a quiet and secluded rural setting in the quaint traditional village, the many amenities of both Paphos and Polis being a short drive away. The property has been designed to maximise the enjoyment of the stunning mountain views which can be seen from all the main rooms. The living accommodation is open plan including a well equipped kitchen, large dining area and comfortable lounge with feature fireplace, all nicely separated by decorative arches. Off the dining area is a large conservatory/sun room and near the entrance a modern guest cloakroom. A hallway leads from the lounge to three double bedrooms with fitted wardrobes. The master bedroom has a walk-in closet and large en-suite bathroom and there is a shower room accessed directly from the hallway. All three rooms have wonderful mountain views and patio windows providing easy access to the outside pool terrace and gardens. The landscaped gardens and plot offers many different areas to enjoy, including the private swimming pool and surrounding terrace with pergola to the side. At the far end of the garden is a circular pergola covered in vines – an idyllic spot from where to relax and enjoy the sensational views. To the front of the property is a driveway and car port providing plenty of space for parking. An external store room is another useful feature. For those looking for a unique peaceful setting and yet not far from amenities, this property is well situated. Although modern in design, it has many character finishes including wooden beamed ceilings and wood burner fire.